For the first thirty plus years of its history, the town of St. Charles was known as Les Petites Cotes, a French name meaning the little hills along the river. 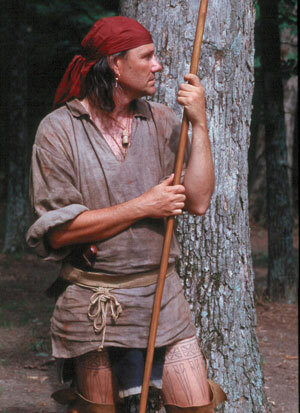 The village habitants were of French and Native American heritage, but the territory itself no longer belonged to France but instead to Spain. In 1789, the citizens of Les Petites Cotes petitioned the King of Spain for permission to build a church. Approximately 30 men gathered at the house of Louis Blanchet in the presence of Don Manuel de Perez, Lieutenant Governor and Commandant of the District, to sign the document. Nearly all signed with a mark, including Blanchet who served as the local commandant. 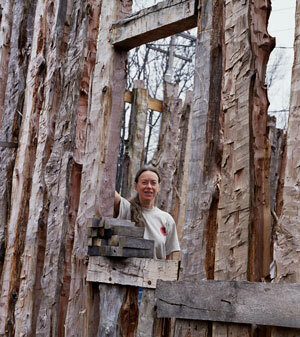 The petition stated that the church be constructed of vertical logs set in the earth and measure 40 by 30 feet. Late in the fall of 1791, the log church was completed and dedicated. It was not until July the following year that a priest arrived to serve the parish of St. Charles Borromeo. Perez and Father Jean Antoine Le Dru conducted the dedication on November 7, 1791. Perez had written to his superior in Spain in 1790 that the village had “decided to choose as patron, St. Charles, in the name of our August Sovereign.” He was referring to the current King, Charles IV. Exactly when the village name changed to St. Charles is not known. William Clark referred to the village as St Charles in 1804 when he spent five days here. …this Village is at the foot of a Hill from which it takes its real name Peeteite Coete or the little hill. 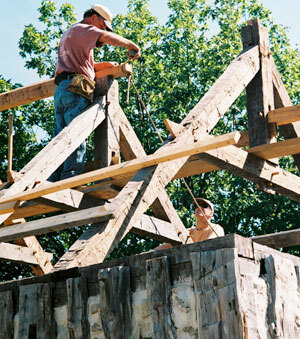 Vertical log construction was an architectural style unique to the French in the New World in the 17th and 18th centuries. Poteaux en terre (squared post in ground) buildings were once commonly found in French villages in the Missouri/Mississippi River Valley. Now only four extant examples remain. Three are in Ste Genevieve, MO. 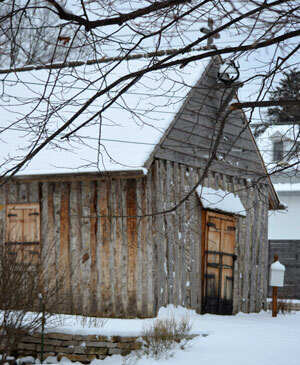 The 1791 log church is referenced in land deeds and other early records. Although we do not know the exact footprint of the church, it is clear that the church was built on the north half of City Block 28 – on the west side of the current 400 block of South Main. Church records date the cemetery at the site to 1789. 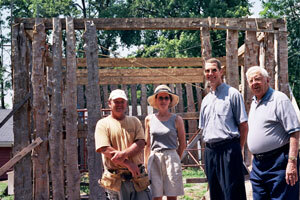 A small group of volunteers and two local historians have rebuilt the 18th century vertical log Borromeo church. Construction began in the summer of 2004 and was completed in January 2008. This was the first time in 200 years that a French-style vertical log building had been constructed in this area – perhaps in all of North America. The reconstruction was made possible by the private donations of individuals inspired by the early history of this old French village, the parishioners of the St. Charles Borromeo Church, the City of St. Charles, the Office of Mayor Patti York, private donors, the in-kind services of a long list of local companies, and the volunteer labor of a small dedicated crew. 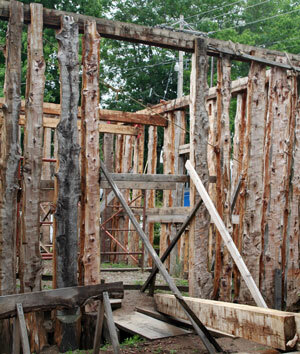 The intention of this project was to provide an on-going educational demonstration of the building techniques and architectural style of the early French colonists and to provide a focal point for continuing cultural education and historical interpretation. Jesse Francis, a local preservationist with 20 years experience restoring and reconstructing 18th century French architecture in the Mississippi Valley, directed the reconstruction of the church. Brian Hanke and Carolyn Whetzel Hanke served as crew. Henry Elmendorf served as friend, inspiration, and fundraiser. Steve Powell served as advisor and liaison with the larger community. The list of volunteer labor hours is filled with names from South Main, the St. Charles community, the St. Charles Borromeo parish, friends, and family. 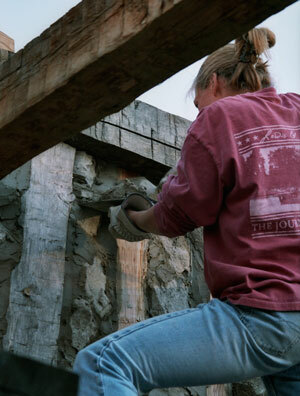 Volunteers spent long hours hewing, notching, digging, raising beams, chinking, photographing, and explaining the project to the watching public. The heavy work of the actual construction fell on the capable shoulders of Jesse Francis. 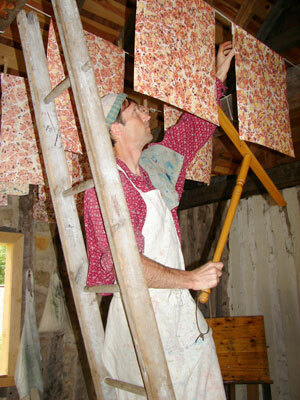 The work was done completely by hand with period tools in the manner of the 18th century. The building measures, roughly, 15 by 25 feet. The cedar vertical logs are 13 feet in length. They sit 3 feet in the ground and are hewn on both front and back from the top to the ground level, leaving the underground portion of the log in its natural round state. Adjoining sides of the logs are channeled on both sides from top to ground level to hold the rock and lime fill. 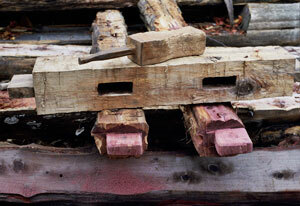 The oak trusses are held together with pinned mortise and tenon joints, as are the door and window frames. 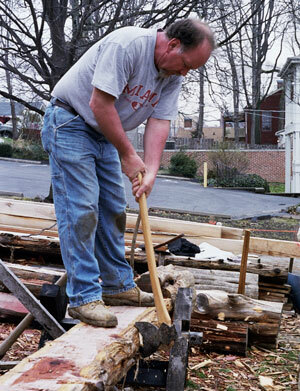 The log church was rebuilt on its original site – the north half of Block 28 between Jackson and Tompkins on the west side of South Main Street- just behind the shop at 401 South Main. Construction materials are rot and termite resistant cedar logs, split cedar shake shingles, oak roofing timbers, hand forged iron hinges, brackets, and locks, and native limestone flooring. Architect Jack Luer of the Charles E. Peterson Institute for Preservation of French Heritate donated plans for the church, based on an original 1780 vertical log church in the Missouri/Mississippi River Valley. Mr. Peterson, who passed away August 17, 2004, was best known as the creator of the Historic American Buildings Survey (HABS), the National Park Service’s nationwide program to document and preserve historic structures. Several men of the Lewis and Clark Expedition attended mass in the original church on May 20, 1804. William Clark’ s May 20, 1804 journal entry reads, Sent 20 men to Church today…to hear a Sermon to day delivered by Mr. ___ a romon Carthlick Priest. This was the last place of worship for the men leaving on the voyage and perhaps the first place of worship on their return. Although Captains Clark and Lewis did not attend mass, the French boatmen hired by the corps were Catholic and were undoubtly the men noted by Clark. One French boatman hired in St. Charles was Jean Baptiste La Jeunesse who returned with the expedition’s keelboat from the Mandan villages in early winter 1804. He and his wife Elizab ette Malbeuffe continued to live in St. Charles; Elizabette’s father was a cousin of Louis Blanchet and her mother was a Native American, perhaps Mandan. Baptiste died in May 1807 and was buried in the churchyard. In the late 18th century there was no such thing as a town hall or public building. Instead, the church was the center of community life. After Mass on Sunday there were auctions, announcements, amusements, singing and dancing, and games. The French celebrated twenty-seven official holidays. The church was also the place where Americans like Daniel Boone, who moved into this Spanish territory before the Louisiana Purchase, took the oath of loyalty to the Spanish King and the Catholic Church. Daniel Morgan Boone, Boone’s oldest living son, and Sara Griffin Lewis were married in the church on March 2, 1800. The church was open in 2008-9 as part of an on-going historical interpretive program based on re-creations of the daily activities of the French and Métis habitants, their Native American relatives and neighbors, American farmers from Kentucky and Virginia, boatmen and voyagers, and indentured and bound servants who made the village of St. Charles their home. Historical interpretation also included period workshops and period musical events. The log church is now open to private events including weddings, receptions, period dinners, and other social functions. Church doors are open everyday from March 1 through Jan 1 depending on weather conditions. Hours are Mondays through Saturday from 10:00 A.M. to 4:00 P.M. and Sunday from 1:00 P.M. to 4:00 P.M. On fair weather days, hours may be extended. The Historic 1791 St. Charles Borromeo Log Church is a project of JQH Historic Preservation for Education, a non-profit Missouri corporation.